Loopy Loops! Wavy Waves! By Megan Vega. I Love Hair! Retro rules in hair fashion these days as the wave patterns spotted on catwalks and editorial pages are sporting strong influences from decades past. Crisp finger waves from the 20s, or off base waves from the 30s. To recreate these wave shapes for your clients, or for yourself, combine classic techniques with modern products to produce the right recipe of current looks. To reproduce the 20s wave shape with a modern curling iron, choose a small barreled iron. For fine hair, apply a dime size amount of Schwarskopf’s Body Me product to damp hair and blowdry to 90% dry. For medium to thick hair, I recommend Schwarzkop’s Twin Curl. After, hold the curling iron upside down in your hand and place it in the hair against the head. At the same time, place your comb on the rim of the iron and push the hair with the comb in one direction as you pull the iron back in the opposite direction. For the 30s wave, you can use the same products. Create an on base pin curl and clip it into place. Create an adjacent, off base curl and secure. Continue working in horizontal sections around head, alternating the on base and off base curl pattern. Once the hair cools, release the clips and gently rake or brush through the hair. Both these looks are relatively easy to achieve and turn a regular head of curls or wavy hair, into a fun flirty do for any occasion. Give it a try, you’ll be happy with the results. To book an appointment or a complimentary hair consultation call Cristiano Cora @ 212-414-1333. I Love Hair! Schwarzkopf Professional? This Stuff’s Amazing! By Claudia Weldon. I Love Hair! Even after working as a hairstylist for over 28 years in high-end hair salons, I am still looking out for new and innovative hair products that really work. Here at Cristiano Cora Studio we just switched to the Schwarzkopf Professional line. Being one of the top three hair cosmetic brands in the world Schwarzkopf represents quality, expertise and innovation for more then 111 years now. The Schwarzkopf line covers all products in the categories of hair coloring, care and styling. The hair colors are vibrant and make the hair glossy and shiny. Our Igora Royal color line has 100% white coverage and contains Moringa seed extract which helps strengthen the hair’s inner structure, also improving its elasticity. The shampoos and conditioners are made with the intent of not only protecting the hair from damage, but repairing damage that has already been done to the hair. From your everyday repair shampoo, to color protectant, which also contains the Moringa seed extract, to shampoo and conditioners for curly or dry damaged hair. It’s all covered. The hair products are light easy to apply and won’t weigh the hair down. There’s something for every hair type, whether you have coarse unruly curls, or fine flowing tresses. But best of all the Clients love it!!! Come in and try out our products! Call Cristiano Cora Studio to book an appointment or a complimentary consultation @ 212-414-1333. I Love Hair! Welcome to Cristiano Cora Studio! I Love Hair! 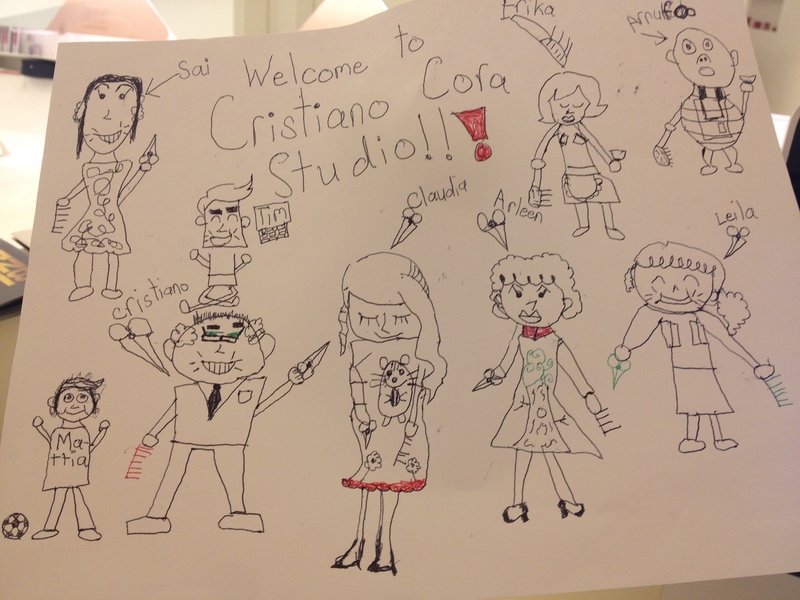 Look at this great picture my son Mattia drew of my stylists here at Cristiano Cora Studio. Great! I Love Hair! Blonde Beautiful! By Krystal Santiago. I Love Hair! So, summer officially hit NYC with high 90 degrees, and Schwarzkopf has officially hit Cristiano Cora Studio! I couldn’t be more excited for both. More importantly the BlondMe line! 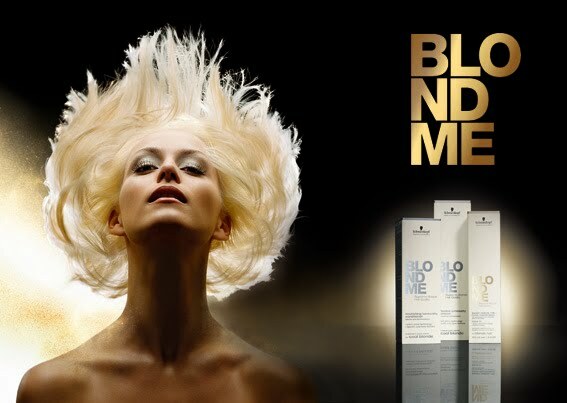 BlondMe provides 9 levels of lift while depositing cool tones. “Speak English!” Ok, it can take dark brown hair and make it really blonde; and, even better, a non-brassy, non-yellow cool blonde. Think Christina Aguilera “Back to Basics” or Marilyn Monroe blonde, without the dry limp hair. It’s a nice way to be beach blonde while at the beach. Don’t forget to pair it off with the BlondMe Silver Shampoo, which has a purple hue, to help keep the brassiness at bay. If you are one not fond of blonde, there are many other options for you. One option is Igora Royal which offers 100% grey coverage! Or for you environmentally conscious clients, we have the Essensity line, which offers a color that contains 90% natural ingredients. Have fun and try something new. There is definitely color for everyone. Come into the salon and talk to a colorist to see what’s best for you. To book an appointment or a complimentary consultation, call Cristiano Cora Studio @ 212-414-1333. I Love Hair! The Look of Summer. By Roger Garcia. I Love Hair! It has become very apparent to me that with the intense climb in temperature also comes a dire need for solutions in styling. Although many women that have close to shoulder length hair have opted to just simply “go shorter”, what about the rest of you? Scrunchies … Are definitely out of the question! If your in need for something quick and easy I would recommend using nylon hair bands. Try using these bands instead of scrunchies or even rubber bands. They will offer just as tight of a hold throughout your day without causing unnecessary breakage to your beautiful locks. Keep in mind that if your unpleased by the color of the band, simply take out a small section from the existing ponytail and wind it around the band. Securing it into place with the appropriate pin. From here you can quickly transform a simple low slung ponytail into a tousled messy up-do that doesn’t necessarily require expert hands to create. Start by taking individual sections from the pony rather then keep them smooth, either work with the natural wave or slightly tease the ends a little. Teasing the ends will actually help in the following step which is to wind that section around the existing band and using a couple of pins to secure the ends tightly. Continue with the rest of your pony, until it’s all up. As a personal touch I like to go back and fan out some individual strands, causing some texture to come through. If your looking for a smoother look just skip that step and finish with a hairspray that will get the job done, without leaving you a crunchy mess. If you’ve properly secured the bun you shouldn’t have any problems, if your using this as a night time styling aid. I would recommend using a simple headband to prevent any fly aways from making an apperance. To book a hair appointment or a complimentary consultion, call Cristiano Cora Studio @ 212-414-1333. I Love Hair! New Schwarzkopf Line. By Thea Derecola. I Love Hair! Need something in the way of hair therapy for unmanageable hair lacking shine? Frizzy hair can impose quite a challenge when trying to smooth or prepare for blow drying or straightening. Static, fly-away hair and excess frizz can be very difficult to control. 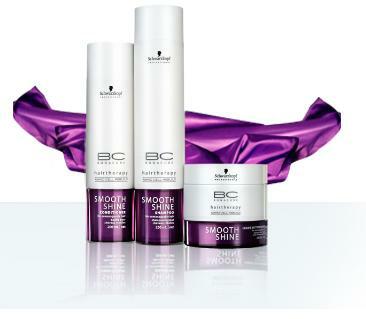 To help with humidity absorption, our new Schwarzkopf Professional BC Smooth Shine shampoo and conditioner control extremely unmanageable hair, thanks to a technology known as Ionic Polymer Shield Complex. It helps in the ultimate routine for silky smoothness and illuminating shine. I’ve used it, and love the results. Shampooing regularly helps maintain a sleek beautiful head of hair, eliminating excess moisture, and maintaining shine and suppleness. With the BC Smooth Shine leave in treatment added to your blowdry routine, you can keep the smooth luxurious hair all day. This stuff works! To book a hair appointment or a complimentary consultation, call Cristiano Cora Studio @ 212-414-1333. I Love Hair!